Salesforce.com added more marketing power to its arsenal today with the purchase of ExactTarget for $2.5 billion. It is the company’s largest acquisition to date, second to Buddy Media, which it bought last year for $689 million. In 2011, the company purchased social-monitoring platform Radian6 for $276 million in cash plus additional stock. The $3.5 billion in acquisitions points to the high costs for Salesforce.com as it makes an aggressive push into the marketing department. ExactTarget puts Salesforce.com into the email marketing business. The company also offers social and mobile marketing capabilities, as well as a marketing automation platform. The deal follows Salesforce.com’s announcement last month of Social.com, which was distinct from the social media ad campaign capabilities that it gained with its acquisition of Buddy Media. More so, Social.com pulls data from a customer’s CRM environment to craft targeted campaigns. With Radian 6, the expectation is that companies can also get a view of the social stream with its CRM data. With ExactTarget, Salesforce.com adds an email-marketing platform that it can use with Social.com. Salesforce.com lacks a true marketing automation platform. ExactTarget does list marketing automation as a capability, but it does not rank as a leader in the category, at least according to Gartner’s magic quadrant. If Salesforce.com does wish to push deep into lead management, it will need to either invest heavily in its own development or acquire a company, which will bring another hefty price tag. Last month, Marketo, a marketing automation leader, had a successful initial public offering. It opened at $13 per share. Today it is trading in the $22 range with a market capitalization of about $812 million. Eloqua, the other leader in the category, sold to Oracle late last year for $871 million. Salesforce.com has established a capability in developing an app ecosystem with its acquisition of Heroku and the development of its AppExchange. 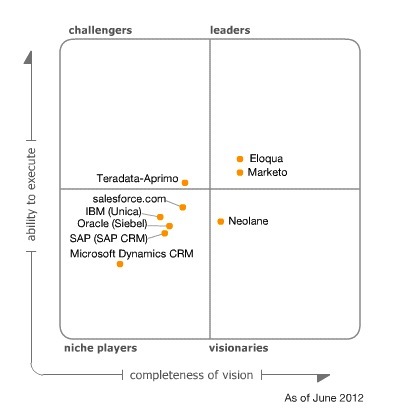 Its CRM platform is now the industry leader. Expanding into the marketing suite fits into its core strength. The question is how expensive it’s going to be to appeal to the ever more powerful chief marketing officer.